Certainly calls into the question the Kool-aid notion of California wine. That picture looks exactly like me making some tropical punch kool-aid as a youth. Methinks that '07 futures will still be experiencing a hangover from '06, irrespective of the chap issue. People are tiring of the way pricing is set. 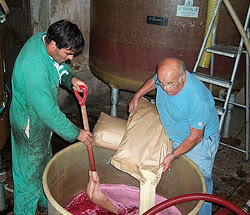 I'm, yawn, over the French and the futures issues when at the same time the French are distilling wine for alternate uses. It does look like Kool-aid, especially with that giant bag of sugar. This is certainly another black eye for Bordeaux, and it will be interesting to see how--and if--they respond.